Welcome to our 5-minute guide to boiler flow and return pipe temperatures. As your boiler heats up water, it’s pumped out and circulated around your central heating system; this hot water comes out of the flow pipe. The water then travels around your heating system and returns to the boiler via the return pipe. You’ll notice that the flow heats up quickly, and is usually hotter than the return pipe. This is because all pipework and radiators are cold when you fire up a boiler. They absorb some of the heat from the water, and so the water coming back via the return is cooler. As your central heating slowly warms up, the differential in temperature between the two pipes will become closer. To circulate hot water quickly, boilers should be fitted with a minimum of 22mm sized copper flow and return pipe. This can rise to 28mm and beyond for large properties, or commercial boilers. When dealing with problems related to flow and return pipe temperatures, this is the most common; a cold boiler return pipe, even though the flow is hot. Naturally, the flow will heat up quicker than the return. But, if the return pipe isn’t getting hot (or at least warm), there are a few potential culprits. Need help with diagnosing and fixing issues with your central heating? Get help here. Once your boiler has heated the water, it’s the pump’s job to circulate this water around the system. If the pump is faulty, there’s a good chance it’s not circulating this water quickly enough. By the time the water gets back to the boiler via the return, it will have cooled considerably. So, the return pipe will be much colder than the flow. PCB is not communicating with the pump correctly. We’ve created a detailed guide on heating pump problems and the fixes here. Airlocks of any kind can cause a heating system to work intermittently. All air needs to be bled from the system. Radiators and towel rails have a bleed valve that will let air escape. They can be bled with a bleed key. If the return pipe is still cold, the issue could lie in an airlocked pump. If this is the case, there’s a good chance you’ve heard knocking and banging noises as the pump malfunctions. As bleeding the pump requires removal of the outer casing, you’ll need to call a Gas Safe engineer. When return pipes are cold but the flow to the boiler is hot, a blockage is the most common culprit. Limescale comes from minerals in water, and will attach itself, well, just about anywhere. Heating sludge on the other hand comes from internal rust from radiators and pipework. When this breaks off, it can block radiators, and even the return pipe on your boiler. This restricts the flow of hot water, so radiators don’t get hot and of course, the temperature of the return pipe’s water is Luke-warm at best. First, you’ll need to hot flush the system using cleaning chemicals. This will get rid of the majority of sludge and limescale. It’s worth noting, both above devices will need to be cleaned out at each service. If not, they will fill with debris, and won’t be able to catch anything else circulating in the system. Next, we have microbore pipework. If you have 8mm or 10mm pipe feeding radiators and towel rails, there’s a chance that’s either restricting flow, or blocked (see #3). When you have a heating engineer come and diagnose and fix the problem, make sure you show them any microbore pipework. Depending on the layout of your pipework, this might need to be replaced. There’s a chance it’s been fitted incorrectly. Heating systems are spec’d based on BTU. It’s a measurement of heat. Pipework, radiators, your boiler and even the boiler’s pump will have been spec’d to the BTU of your property. By adding radiators or towel rails, you’re requiring the boiler to heat additional water, and the pump to circulate more water. It’s not very common, but if you have added towel rails or radiators (especially large ones, like a 1600mm+), there’s a chance that’s starving the heating system and that’s leading to a cold return pipe on the boiler. 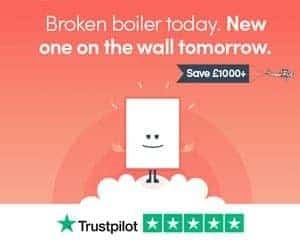 Without surveying the size of the property, the boiler, the boiler’s pump and the amount of towel rails and radiators, it’s hard to see if this is the problem. Have a qualified heating engineer come and check out your heating system. 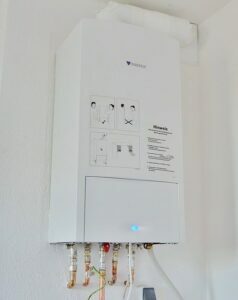 Need help fixing the problem with your central heating system? Book in an engineer here. Thanks for reading our 5-minute guide to central heating and boiler flow and return pipe temperatures. Hopefully, this gives an indication of why your return pipe to the boiler is not getting hot, but your flow pipe is. Have any questions? Leave a comment below and we’ll get back to you as soon as possible.